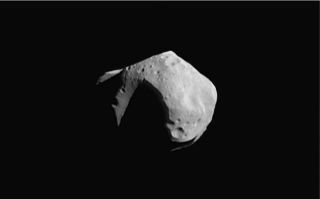 Asteroid 253 Mathilde, a C-type asteroid with a composition similar to 52 Europa. Uncle Sam may want you to celebrate Independence Day this Fourth of July weekend, but NASA is calling on Americans to help measure an asteroid. On July 3 at 11:05:30 p.m. EDT (0305 GMT), the asteroid 52 Europa will pass between Earth and the star TYC 0292-00339-1 in the constellation Virgo, temporarily blocking the star's light in what astronomers call an occultation. NASA is soliciting amateur astronomers to observe the asteroid's occultation of the star and report their findings to the space agency via Twitter. With many precise measurements of the time it takes 52 Europa to pass the star — which will be evident by the time the star's light is blocked — astronomers can calculate the size of the rock. NASA will hold a live Web chat with Dr. Bill Cooke and his team from NASA's Meteor Environment Office at the Marshall Space Flight Center in Huntsville, Ala., from 9:30 p.m. to midnight EDT on July 3. The public is invited to ask questions and observe the occultation via a live Ustream feed. To access the chat, click here. This map shows the parts of the United States that the asteroid 52 Europa will be visible in telescopes when it crosses a star late at night on July 3, 2011.This event will not be viewable with the naked eye, but you can see it through your telescope , NASA says. Observers from Florida through Montana and into Canada should be able to see the occultation. The combined light of the asteroid and the star will drop by 2.1 magnitudes to 12.1 magnitudes — the magnitude of the asteroid — for at most 17.9 seconds. On this astronomers scale for measuring brightness, smaller numbers represent brighter objects. To see if asteroid 52 Europa will be over your location in North America, see this NASA-provided viewing map or get more details on the encounter from the space agency's asteroid skywatching announcement.